Mastered in HD from the original 35mm negative! 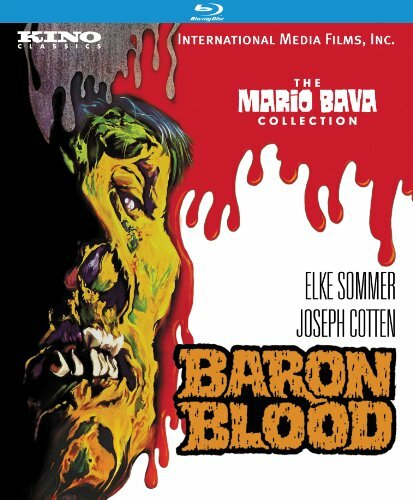 New York, NY - December 6, 2012 - Kino Classics is proud to announce the Blu-ray and DVD release of Mario Bava's cult horror classic Baron Blood , starring Elke Sommer and Joseph Cotten, in a new HD transfer mastered from the 35mm negative. Baron Blood comes to Blu-ray and DVD on December 11th, with a SRP of $29.95 for the Blu-ray and $24.95 for the DVD. It comes packed with special features, including audio commentary by Tim Lucas, author of Mario Bava: All the Colors of the Dark, alternate title sequences, original theatrical trailers, radio spots, and original trailers of other Bava films. After spending several years exploring more contemporary genres, director Mario Bava (Black Sunday) returned with Baron Blood to the gothic as a setting for a gruesome thriller. Working with producer Alfredo Leone, Bava crafted a film that is loyal to the bylaws of traditional horror, but is infused with a more modern visual style. An American professor (Antonio Cantafora) travels to the estate of his ancestor, the sadistic Baron Otto von Kleist, seeking the truth beneath his notorious reputation. When he and his assistant Eva (Elke Sommer) read aloud an ancient incantation, the Baron's spirit is resurrected, leading to a series of violent deaths within the haunted castle.